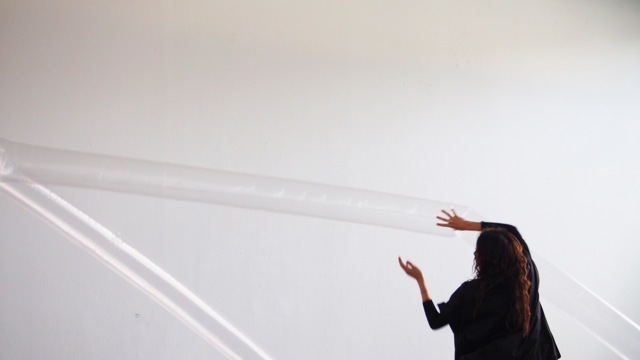 Teresa Hsieh’s practice encompasses sculpture and installation in an investigation into the connections between the internal and external relationship with the body. She considers space as an art object in the importance and value of this existential element. It heightens visitor’s senses in the perception of informal and unfamiliar ontological membranes in the modes of being, challenging our compulsion to construct meaning and interpretations. Teresa is currently completing Honours in Fine Arts at the Victorian College of the Arts. Trust for One Series embodies the physical and emotional act of trusting oneself or another individual. A trust exercise that explores the feeling of falling backwards into the arms of an individual. You trust your own body to fall gracefully or somewhat straight into the position desired. Anxiety, panic and nervousness drown your capability to let go. You need mass amounts of reassurance to be caught. The concept follows, what if there was no individual to catch your fall but an essence of yourself to rely on. These membranes are made for me given to you. Each inflatable membrane is to my scale, from the very top of my stretched-out arms to the very ends of my toes. My body needed these emotionally and physically support, essentially giving myself a gift that unleashed a sense of freedom, and to allow a transmitting sensation onto others. For them to find the moment of sensation and to communicate back to me, a circularity dialogue. The intention is to value the circumstances of viewing the internal and external vessel in relation to the body which requires a support system to function. This comes with a tension or pressure to be involved with these inflated membranes. Trust for One Series entails the workings of the human body in solitude to allow all visitors to reflect and engage in a curious matter representing myself, as an exploring artist fascinated by the wonders of my own and others body language in an element and materiality that is unseen.